After President Obama declared his intention to repeal the “Don’t Ask, Don’t Tell” policy that prohibits gays and lesbians from serving openly in the military this year, the Pentagon initiated a working group to determine how to implement the repeal. 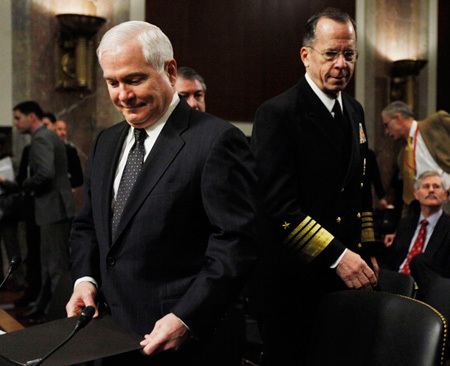 Secretary of Defense Robert Gates noted in his testimony to the Senate Armed Services Committee earlier this year that, “the question before us is not whether the military prepares to make this change, but how we best prepare for it.” In keeping with this goal, members in both the House and Senate have moved forward with legislation to repeal this discriminatory law. Yet Secretary Gates and Chairman of the Joint Chiefs of Staff Admiral Michael Mullen last week informed Congressman Ike Skelton, chairman of the House Armed Services Committee, that they would strongly oppose any legislative action to repeal “Don’t Ask, Don’t Tell” before the working group issues its recommendations in December. This approach would unfortunately further delay repeal. A better way forward is to have Congress move to repeal DADT while the Pentagon is working on its review of how to best allow open service. The key is to make sure that Congress specifically acknowledges the Pentagon process in repeal legislation and that repeal does not take place until after the working group prepares its findings. Consulting our troops should certainly be a component of the process to repeal “Don’t Ask, Don’t Tell,” but leaving the decision up to the troops alone would be unprecedented, and in fact, would undermine the chain of command. Our allies’ experiences repealing similar bans, as well as our own experience in implementing “Don’t Ask, Don’t Tell,” suggest that a drawn-out process is unnecessary and that the military’s recommendations do not need to be completed before Congress exercises its legal authority to overturn the law. Three of the United States’ closest allies—Israel, Canada, and the United Kingdom—have successfully removed all restrictions on gays and lesbians in their armed forces since the early 1990s. All three countries made quick, successful transitions to policies of open service. The European Court of Human Rights ruled in September 1999, for example, that the U.K.’s restrictions on homosexuals in the military violated the European Convention on Human Rights, of which the United Kingdom is a signatory. The British government announced that it would comply with the court’s decision in December 1999 and removed all remaining restrictions on gays and lesbians the following month. Contrary to what Gates and Mullen set forth in their letter, our allies’ experiences suggest that repeal will be a straightforward process and that a swift policy reversal sends the appropriate signal that both uniformed and civilian military leaders are on board with the decision. Thirty months after the policy change, the United Kingdom conducted a tri-service review of its transition to open service. The response was unquestionably positive. The Royal Air Force reported that “the overwhelming view of RAF [Commanding Officers] is that the change in policy was overdue…All COs agreed that there had been no tangible impact on operational effectiveness, team cohesion, or Service life generally.” Canada and Israel had similar experiences. Legislative action to repeal “Don’t Ask, Don’t Tell” this year will not invalidate the Pentagon working group’s recommendations and input. When the United States adopted “Don’t Ask, Don’t Tell” in 1993, the bill had passed both houses of Congress by October, but the Pentagon did not issue final rules on how to implement the policy until December. And DOD was still making adjustments to the implementation policy in early 1994. As this experience suggests, DOD will still have ample opportunity to weigh in on the measures needed to implement the repeal if Congress acts to overturn this damaging policy before the Pentagon working group has finished its study. Indeed, both the House and Senate should work together to ensure that “Don’t Ask, Don’t Tell” repeal legislation includes language that explicitly acknowledges the Pentagon’s review process. The final bill that Congress sends to President Obama should include provisions that offer the military working group a reasonable timeframe in which to complete their work and formulate the policies needed to implement the repeal. Gates and Mullen are right to be worried about sending a “very damaging message” to our men and women in uniform. Yet the damaging message that they so fear is the very one they are promulgating by keeping “Don’t Ask, Don’t Tell” on the books. The U.S. military has discharged qualified, patriotic service members for 17 years solely on the basis of their sexual orientation. We have sent the message that the military is an intolerant place that does not value what Americans value, namely diversity, fairness, and equality, and that the military cares more about whether a person is straight than whether they can shoot straight. The Pentagon working group should lead the process of informing how the military should go about implementing the repeal of “Don’t Ask, Don’t Tell,” but Congress must also move forward now to provide the legal authority to ensure that the law is repealed this year and implemented upon successful completion of the working group’s study. This concurrent process would be in keeping with the president’s call to end “Don’t Ask, Don’t Tell” this year and would be the most expeditious way to end this outdated, discriminatory policy.